People buy success, of course, rather than the theory of success. 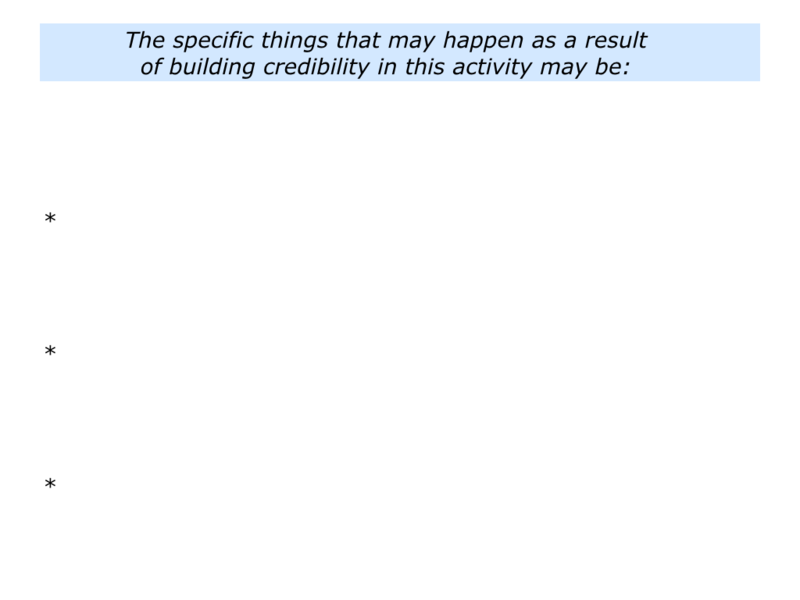 So it is vital for a person to build a track record of delivering the goods. Some people demonstrate the energy and entrepreneurship to take this step. They may volunteer their services, for example, and perform superb work. They start building a portfolio of success. This helps to them earn trust when approaching potential customers or employers. Some people get stuck at this stage. Some search for magical ways to promote themselves without actually getting their hands dirty. Some try to create the perfect product or service without meeting a customer. Some prefer to wait until they get the perfect offer. Looking back on your own work, when have you established credibility? You may have done this as a counsellor, teacher, nurse, engineer, leader, business owner, knowledge worker or expert in a specific field. 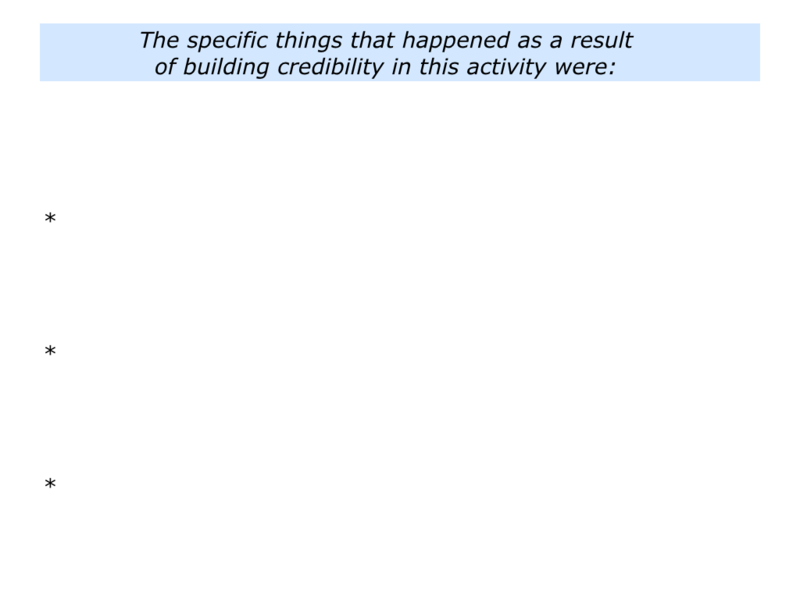 Describe the specific activity in which you built credibility. 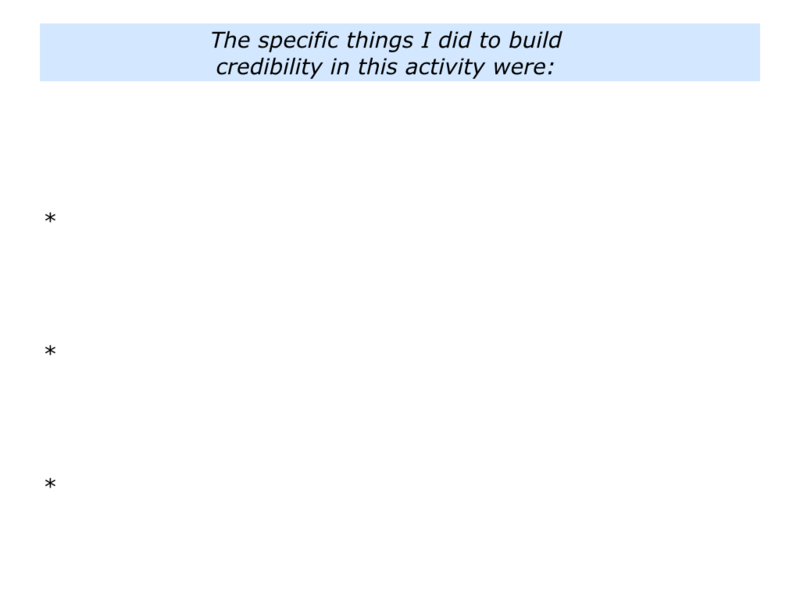 Describe the specific things you did to build credibility. 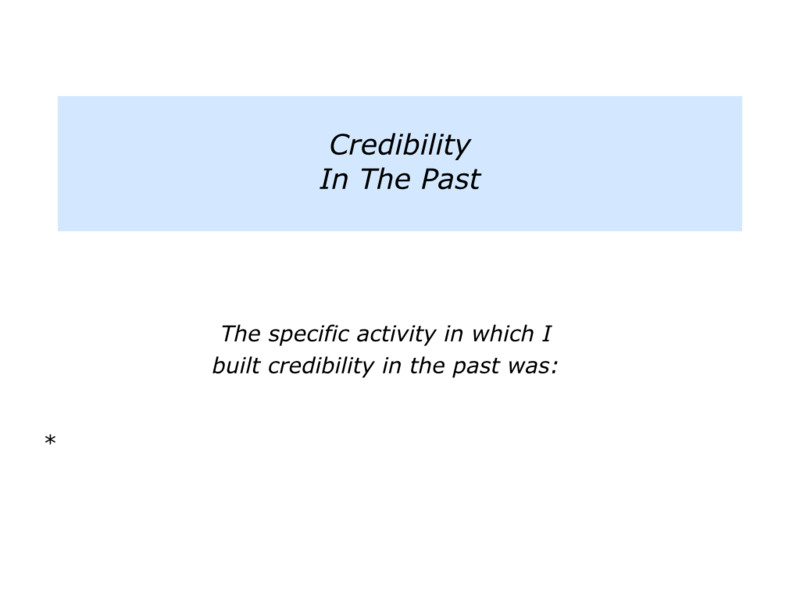 Describe the specific things that happened as a result of building credibility. 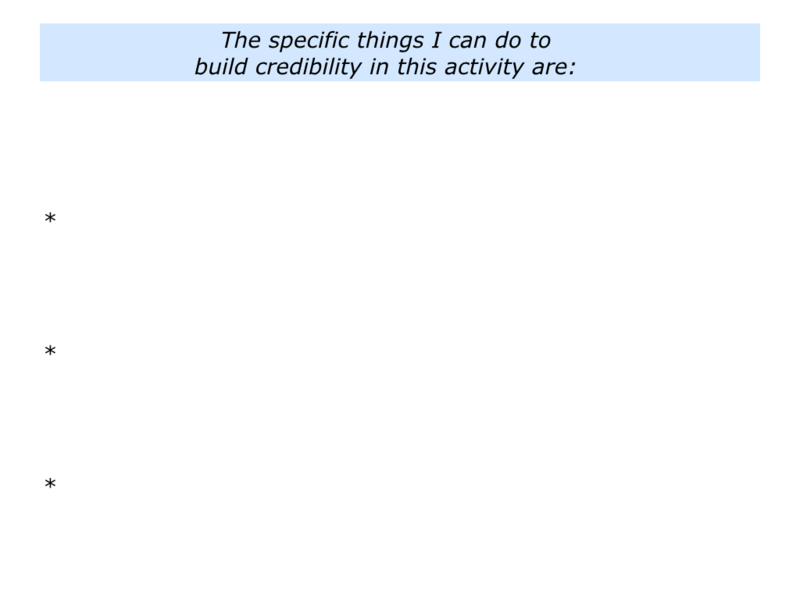 Different people establish credibility in different ways. Below are some themes to consider when exploring this topic. One key point is worth bearing in mind, however, when considering these themes. It is important to apply the approach that is most appropriate to the situation. 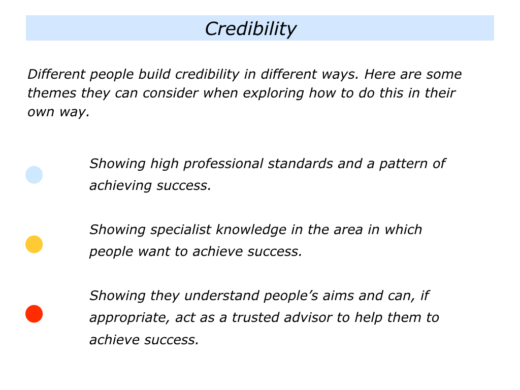 Many trusted advisors, for example, actually start by focusing on the third theme that is described below. They aim to connect with the potential client and the person’s agenda. They then provide practical help that enables the client to get an early success. Delivering a quick win helps to build confidence and lay the groundwork for tackling other challenges. Bearing this in mind, here are the themes that it can be useful to consider. Great workers realise they are always on stage. They recognise that other people are watching and will make judgements about what they do and deliver. They therefore maintain high professional standards. Professionalism is a good starting point, but potential customers also want reassurance. They want to feel confident that the person offering the service has a track record of delivering the goods. Patients who are diagnosed with an illness, for example, will often research the potential treatments. They will explore the choices, the consequences and the chances of success. The same rule applies in many fields. Potential clients want to know what a supplier will deliver – not just what they will do. They want more than a list of experiences and skills. So it can be useful to show a pattern of delivering success. Different people do this in different ways. Being a knowledge worker, I prefer to share what has worked – rather than try to sell – and also put people in touch with previous clients. You will, of course, develop your own approach to sharing past successes. 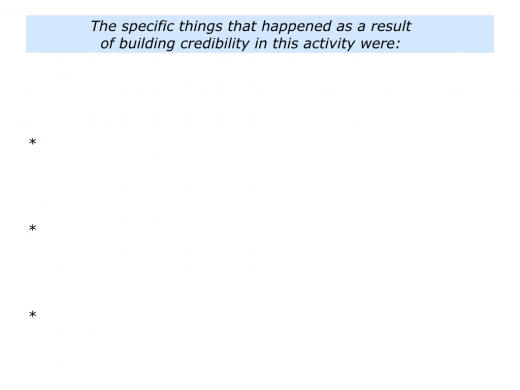 Great workers gain credibility by showing their expertise. They share their knowledge in ways that are informative, rather than intimidating. A potential buyer can see how the knowledge can help them to succeed. “Some of the potential options for going forwards – together with the pluses and minuses of each approach – include the following. Such workers give specific examples that the listener can relate to and, if appropriate, apply in their own life or work. This builds confidence and shows that the worker knows their subject. Great workers sometimes act like trusted advisors. They take the time to connect with a potential customer, for example, and clarify their aims. They then offer help that is personal, practical and profitable. Personal – It relates to the person and their goals. Practical – It is practical and helps the person to reach their goals. Profitable – It is, in the widest sense, profitable and helps the person to achieve their goals. Different people apply this approach in different ways. The key, however, is to provide expertise that enables others to achieve success. Delivering the goods helps to build a positive reputation. Let’s return to your own work. 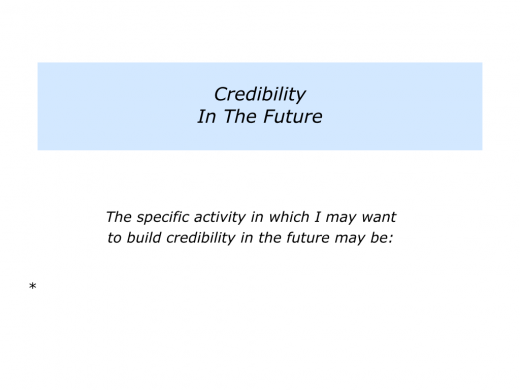 How can you continue to build credibility? How can you do this in a way that feels comfortable? Describe the specific activity in which you may want to build credibility. Describe the specific things you can do to build credibility in this activity. 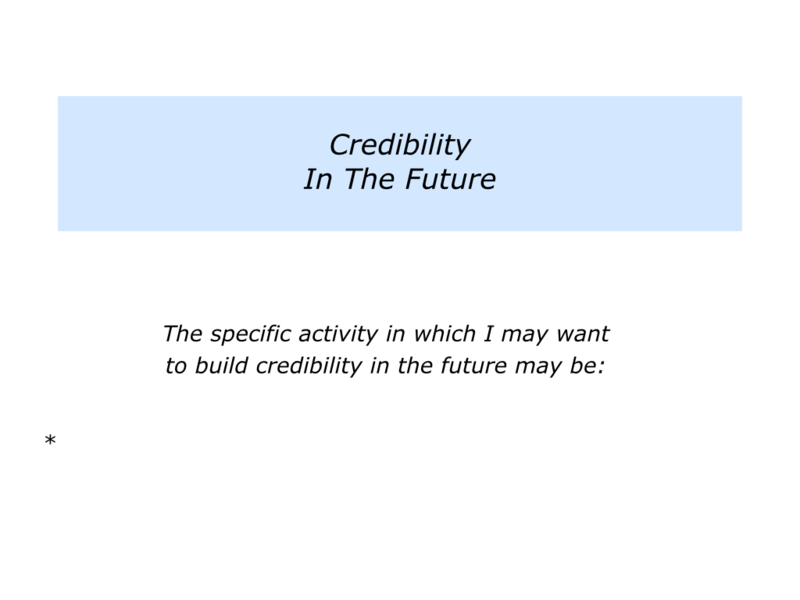 Describe the specific things that may happen as a result of building this credibility.